Ok ladies, and gentlemen it's time to get our sewing on! I posted my A rose is a rose, is a rose, is a rose dress with the feature of the dress being these sleeves that resemble ... can you guess? Roses. I thought I would take this opportunity to show you just how to make these sweet sleeves yourselves. Heck, why stop at sleeves? The possibilities are endless! An embellished skirt, bodice, elbows ... what ever tickles your fancy. Let's 3D the hell out of our new outfits! Bear with me lovely people as this is my first tutorial, so be nice! Scroll down for the detailed videos after reading the instructions. Two cut out sleeve pieces - what ever style will best suit your dress! Cap sleeves, long sleeves short sleeves. 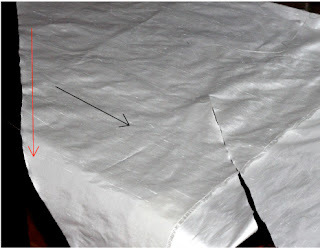 Fabric - you'll want to use a fabric that looks good on both the right and wrong sides of the fabric as both will be visible on your sleeves. Depending on what look you are after, it's better to use firmer fabrics such as cottons, dupion, taffeta, organza; fabrics that have a bit of body to them. Softer fabrics like chiffon and georgette would flop. Mind you, that could create an interesting effect ... ok.. focus. 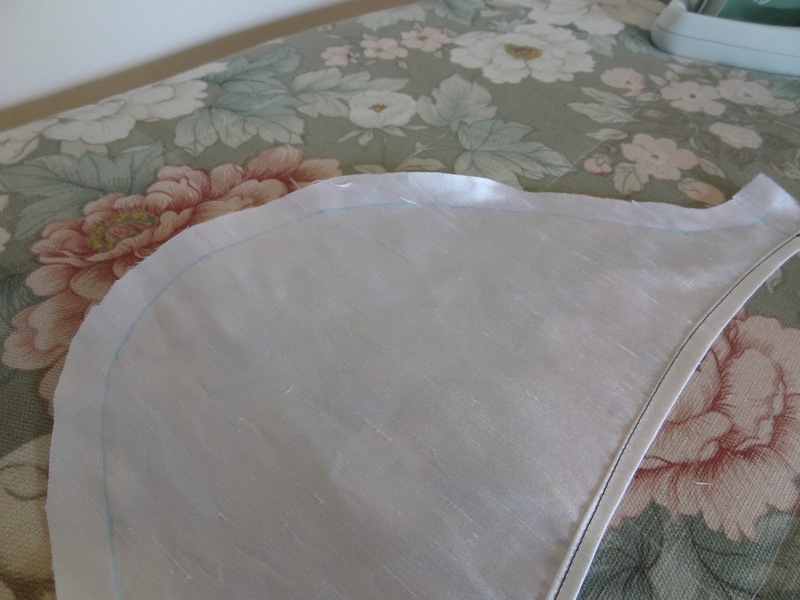 To make the ruffles we need to cut the fabric into long strips. These strips will be gathered and attached to our sleeves. You'll notice on my sleeves that the edges of the ruffles are raw. 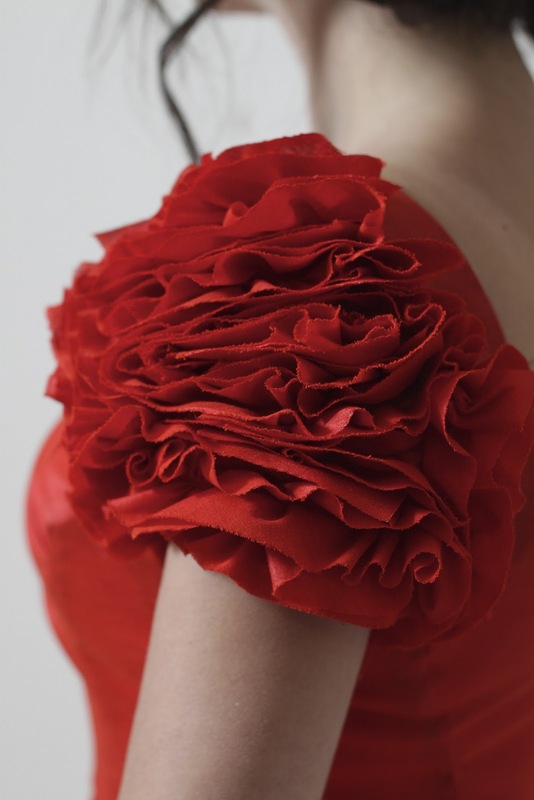 It gives it that textured look which goes with the wildness of the ruffles. You'll notice though, that the edges aren't fraying all over the place and it's all got to do with how I cut the fabric. There is one very important step to take when cutting your fabric in preparation for the ruffles, and that's to cut it on the bias. 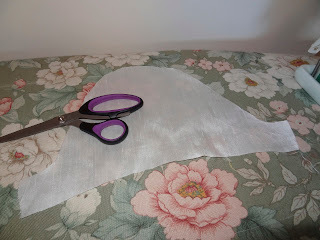 If you cut the fabric on the straight grain, it'll start fraying continuously until it resembles a hula skirt - and not in a good way. 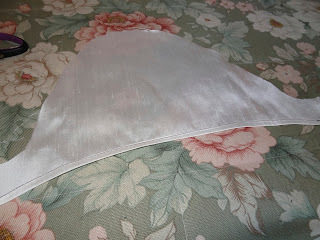 I've shown a photo of silk dupion below, as the grain line in this fabric is the most visible. The black arrow shows the direction of the grain line. The red arrow shows the direction that you want to be cutting the fabric (the bias). Look at the difference in the fabric edge cut on the straight grain and fabric edge cut on the bias. The fabric threads on the bias edge have got no where to go, they're packed in and contained. The straight grain look like they're having an identity crisis and trying to resemble spaghetti. Not a good look. Cut the material into long strips on the bias. You can make them any width you like. The wider the strips, the fuller (and wider) your look will be. I chose to cut my strips 6 cm's wide. The actual width of each strip once attached to your sleeve will be half the width of the strip as we will be folding these strips in half. 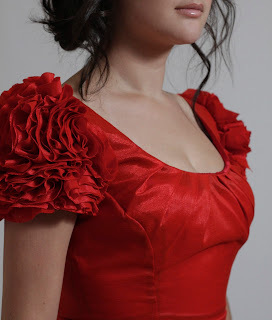 Therefore the ruffles on my sleeve are actually 3 cm's wide. So keep that in mind for your cutting. If you want the ruffles to stick out 10 cm's, your strips are going to need to be 20 cm's wide. Got it?! As for the length of your sleeves there is no rule, you just need more of them if they're short so the longer the better. All right! Once we've got our cut out strips, we are ready to prepare them for ruffling. The ruffles are created by pulling on a gathering stitch so our next step is .. yes you guessed it, a gathering stitch! 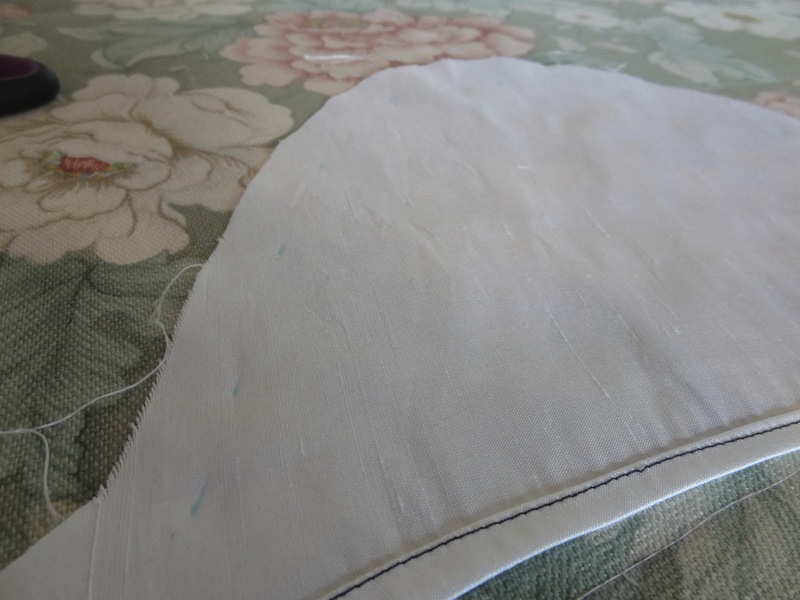 We want to create two rows of gathering stitches 1/4 inch on either side of the centre of our strips and sewn straight down the length of each strip of fabric. 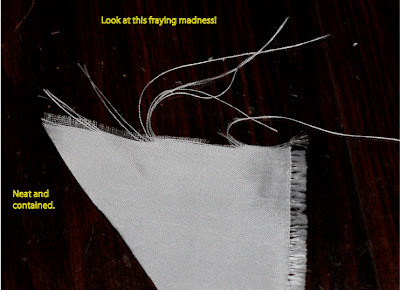 A gathering stitch is made using a large size stitch on your sewing machine. 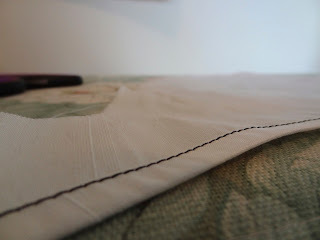 On my Janome I set the length of the stitch to 4 and reduce the tension of the thread to 3 to make it easier to 'gather-up' the stitches. To define the centre of each strip of fabric, fold the strip in half all the way down the length of the strip and lightly press with an iron. This will mark the centre of the strip. Sew a loose stitch parallel to the centre mark 1/4 inch away on either side. Make sure you leave thread tails on either end to make it easier to gather up the stitches. Once you have made two gathering stitches down the length of the strips, pull on the bobbin thread tails to gather up the fabric. Don't worry about making the gathers even. That's the beauty of this technique, is that the more irregularities the better! I gathered mine so that they were tighter in some spots and looser in others. You don't want to over gather your strips either, or you're going to run out of fabric real fast! Now it's time to cut out and prepare our sleeve pieces. This is what we will be attaching the ruffles to. 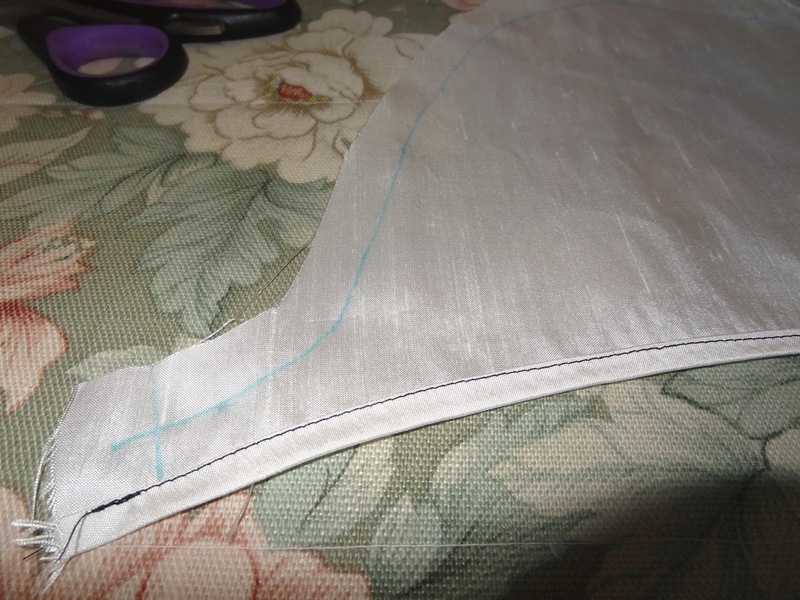 Hem your sleeves before you attach the ruffles. I've used black thread for so that my stitching lines are obvious. Next, using chalk or one of those fancy pens that comes off with water, mark your seam allowance along the raw edges of your sleeve. My seam allowance is 1.5cm all the way around. 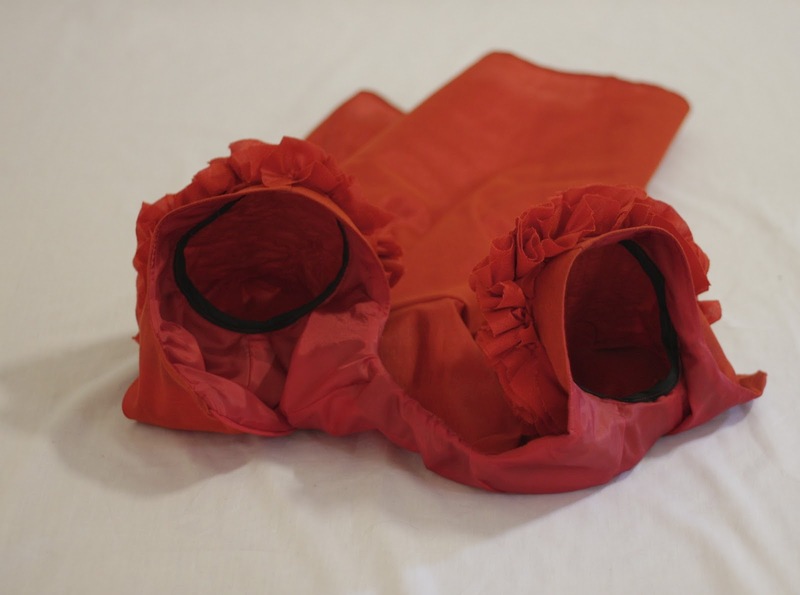 We want to make sure when attaching our ruffles that we don't attach them within the seam allowance. Now let's make us some roses! Watch the video to watch how I attach the make and attach the ruffles. 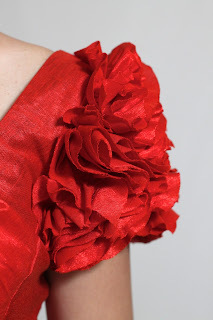 Hope you found this post helpful and good luck with your rose sleeves/embellishments! Great tutorial! What a fun technique!!! Pluck a Duck that's priceless, hopefully you can find a use for you skirt maybe it would make a great bustle. Thanks for sharing its amazing how something so simple to do can look so elegant and appear complicated. Thanks for taking the time to demonstrate this technique. Very clever indeed and I can see lots of applications for this. Your skirt looks much more fun than Pluck a Duck ever was!! Your mannequins are lovely!!! great effort for showing us the how u did the rose effect... I was thinking it would take a lot of effort to go in circles all over the sleeve to make roses... but ur way of straight lines makes it a lot easier! thanks for sharing! Great tutorial on the rose sleeves - that's clever!!! @Amanda S. It is a lot of fun! Thank you for your positive feedback, I was a bit nervous to put up my first tutorial! @Nai Thanks Nai, and now you've got me thinking about the bustle! I love that most things are actually not too complicated once they've been broken down, but can be so effective. Thanks for your kind comment! @Handmade Oh you're so welcome! I love that we have such a sharing sewing community, and it was lots of fun putting this tutorial together. Thank you for elevating my skirt above pluck a duck; I may still find a use for the skirt yet! Betty and Bobby my mannequins also say thank you for your comments. @MaryamThanks Maryam. It's always a relief to find out things are easier than they look rather than harder! Thank you so much for your feedback it is wonderful to hear and my husband was pretty happy about it too :) I find with a lot of sewing techniques once you break them down they are quite simple once the mystery is taken away. Thank you Julia for this tutorial. I am re-fashioning a top and I will try these sleeves. Again, love Betty and Bobbi! Let us know if you use the technique; Id love to see the result! Wow, that's spectacular! Thank you for the great video. I'm not English-speaking, and has been a little hard to understand some phrases, but since you made it very visual, I get the technique easily! What a lovely tutorial! You rose dress is GORGEOUS and the sleeves are spectacular! Thanks for sharing a video... makes the explanation so clear! SO cute...I am excited to try a mini version of this. What an awesome idea. Thanks so much for sharing it! It wasn't at all confusing...in fact it is probably the clearest I have ever seen. You have done a great job. Yes Veronrose, washing is a bit limited with this dress. You definitely want to only get it dry cleaned because washing those sleeves would make them go limp. Great look, thanks for illuminating the temptingly straight-forward method which I missed when you made the rose dress before. My daughter will look a total Senorita in one of these dresses! Very cool technique. I've to to try this. Thank you for this great tutorial! I thought it would be really difficult to create these rose sleeves, but actually it seems quite easy! This is so clear, I cant wait to try it. One of the best tutorials I have seen. Thank you, you are an inspiration Julia! Beautiful and well written. Keep up the excellent work. 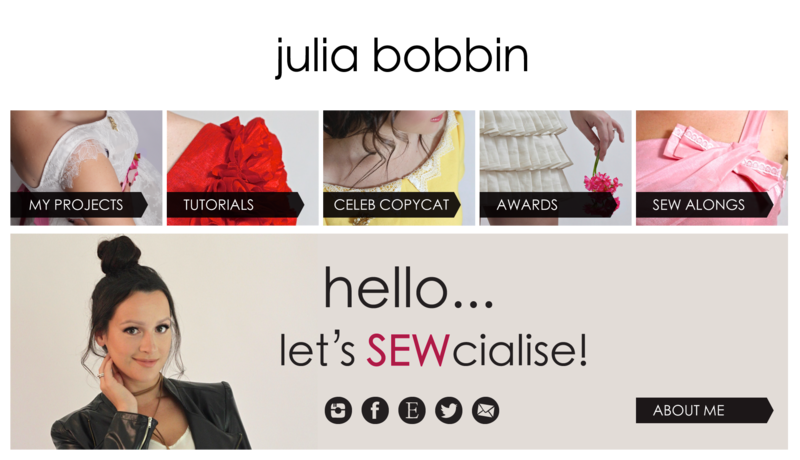 We've featured you at Sew-Whats-New.com today. OH, MY GOSH! What a fantastic tutorial! Now, since roses come in all different colors, I am picturing the ruffles made with multi-colored fabric, such as a batik! This is amazing! I loved your video and can't wait to try this technique! Thanks for such lovely instructions. This is one of the best tutorials I've seen in a long time! Can't wait to try it out!!! Always looking for new concepts for design, this is awesome. Always looking for new concepts for design, this is a well done tute. Thanks. This is fantastic! I can't wait to give this a try on some taffeta. I'm thinking Christmas dresses for my three little ladies. Thanks for the great video instructions. Just wanted to share my dress that I used your tutorial for. SO happy with the outcome! Thank you for your amazing tutorial! Julia, i dont normally comment on people's blogs but i just wanted to say you are too adorable and funny and talented! I envy you and will stalk your blog more often....thanks for the great tute! Thank you for this wonderful tutorial. I love the way that those sleeves look. I decided to try using this in a bit different way and made an evening bag with one side done in the ruffles. I absolutely love the way that it turned out. I found that taking the time to pin the adjacent ruffles when sewing on a new one tended to help me keep them nice and close together without sewing over ones already done. I love you for sharing this tutorial! THANK YOU. Wow, what a unique style. I just love this pretty sleeve design. Thanks dear for sharing this pattern along with us. And I love to share my blog with you, Churidar Neck Designs. Hola! Found this on Pinterest and I love it. I am not a frilly person but I can imagine wearing these sleeves. No, I am not Spanish but that is how these sleeves appear to me. This is wonderful, thank you so much for sharing! My question is, can you machine wash this? will the ruffles stay, and will the unfinished bias edges hold over time without unraveling?